Some of the things that I keep thinking throughout this episode: is Chairman Jin going to kill Sun-Woo? If not him, is it Jang-Il? How Sun-Woo is going to avoid the attempt to kill him? Will Ji-Won get involved in this matter? What about Soo-Mi and others? Luckily, these things don’t happen, but they are slowly getting involved in the secret, whether directly or indirectly. Chairman Jin welcomes Sun-Woo and he lets him enter the hotel room. Sun-Woo starts to massage him as he explains that he’s just a trainee. He compliments Chairman Jin’s voice but he suddenly says that he recognizes it. Chairman Jin keeps silent and then starts telling about his son who died two years ago (is he referring to Sun-Woo himself?). He asks how Sun-Woo got blind and his answer: he fell down a cliff. Sun-Woo also says that his parents died when he was young, proving to Chairman Jin that his memories haven’t returned completely. The massage session ends and Sun-Woo gets ready to leave. Chairman Jin hands him some money to show his gratitude. Chairman Jin apologizes because he can’t be that much of help to him and the sentence triggers Sun-Woo’s memories about the same sentence he heard from him two years ago. He tries to ask for Chairman jin’s name, but he refuses to tell as he’s getting the massage for free. Sun-Woo leaves, but he’s not letting the matter go easily. He goes to meet a lady housekeeper to ask for her help. He tells her to take a look at the man he gave his service to. She describes Chairman Jin as someone who’s rich based on his suits and he’s also wearing glasses, but she couldn’t find out about his name. Sun-Woo then leaves while he’s still deep in thought about it. Soo-Mi decides to drop by Jang-Il’s place on her way to the competition as she leaves her clothes there and Geum-Jool suggests her to go to see Ji-Won, the girl that Sun-Woo likes. While his friends are worrying over his love life, Sun-Woo gets busy searching for Chairman Jin’s photo with his father and Moon Tae-Joo. He gives the photo to the lady to see if she can recognize Chairman Jin but she can’t as the photo was taken a long time ago. He then asks for Geum-Jool’s help to find Chairman Jin’s recent photo, even if he has to steal one form his villa. Soo-Mi goes straight to the rehab center to find Ji-Won as soon she arrives at Seoul. She finds her but then recognizes her as the girl that’s on friendly terms with Jang-Il. She approaches Ji-Won to ask about the volunteer work but soon goes straight to her point: to talk about Sun-Woo. They sit together and Soo-Mi starts explaining about the reason she comes. She’s just being a good friend to Sun-Woo and she doesn’t want her friend to be hurt by love, thus she’s hoping that Ji-Won isn’t playing with his heart. Soo-Mi tells her about his accident and his missing chunk of memories. Ji-Won tells her that Sun-Woo was hit on his head, surprising Soo-Mi who thought he can’t recall anything about the accident. But then, Ji-Won says she must have heard it wrongly. It looks like Jang-Il and his classmates are having a trip to the court to see what the real court looks like. As the lecturer explains the details, Jang-Il focuses on the prosecutor’s seat and the lecturer’s voice fades into his imagination. 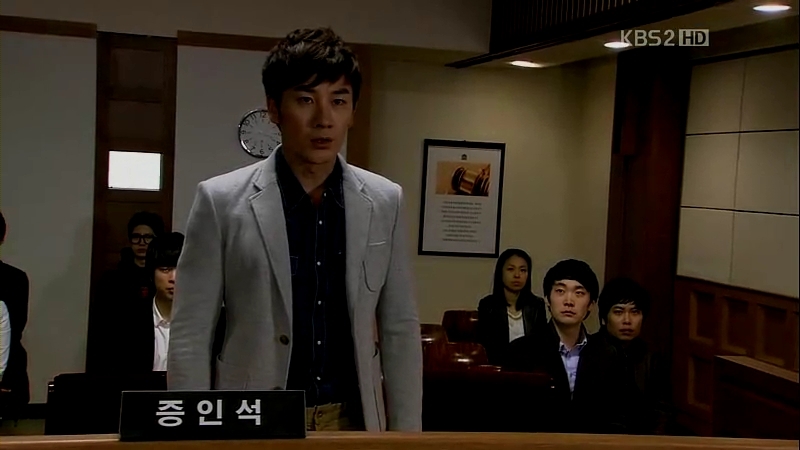 And we get the dashing Jang-Il in his prosecutor’s suit, explaining about the proofs of a murder case to the judges. He confidently asks for life sentence for the murderer and it turns out that the defendant is his own father. Oh my. Yong-Bae keeps calling his name as Jang-Il freezes on the spot. He turns to face the plaintiff and sees Sun-Woo standing there, pointing towards his direction and accuses Jang-Il of hitting him and trying to kill him before the crowd applauds. The clap is actually done by his classmates and he’s brought back to the reality. The tour ends and he goes to study at the library as usual. 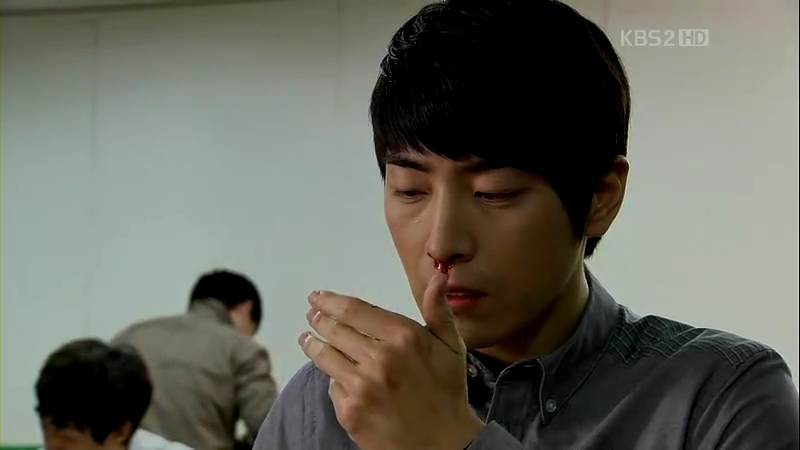 In the middle of his reading, he gets a nosebleed and goes to the washroom. Jang-Il looks at his reflection on the mirror and remembers the rehearsal that he did before. He practices his line to defend Sun-Woo’s accusation on him and claims that he’s still his friend. He walks out and sees Ji-Won but chooses to walk past her. They exchange another glance but still, no words are spoken between them. 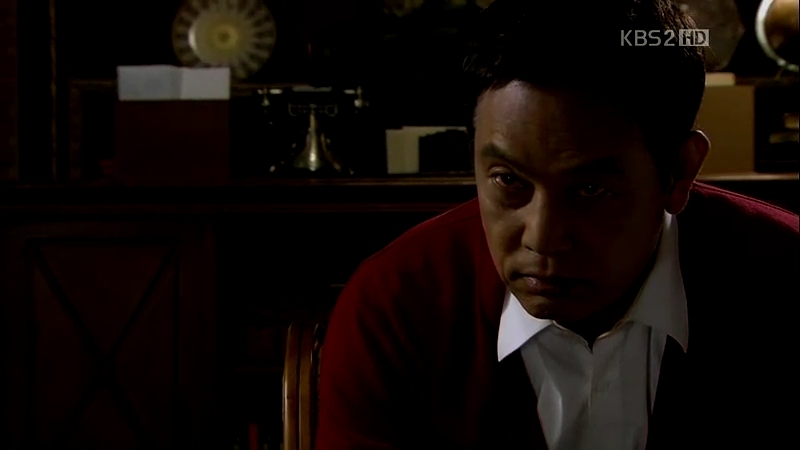 He suddenly gets a call from Soo-Mi, asking about his return to the apartment. She tells him to leave her clothes at the security as he’s going to be late. Chairman Jin returns to his villa and starts discussing about the letter with Yong-Bae he still thinks it’s possible for Sun-Woo to be the one who sent the letters, but Yong-Bae doesn’t think so. However, he keeps denying that someone might saw him on that night. Chairman Jin asks him whether Jang-Il was the one who made Sun-Woo blind, but Yong-Bae thinks his son would never do such thing. He decides to wait for the next letter to be delivered. Sun-Woo writes down his thought about Chairman Jin, whom he had encountered during the massage session. He finds some things weird about him and wonders why he had came to find him. Suddenly, Soo-Mi comes over to stay overnight there. She tells him about her meeting with Ji-Won and muses over how much Ji-Won likes him. Soo-Mi tells him to accept Ji-Won’s heart for that’s the least thing he could do for her. She takes a look at the paper which Sun-Woo wrote about Chairman Jin but he takes it back from her. She can’t hold her curiosity much longer and asks him about what he told Ji-Won. He just feels that he must hit his head for him to become blind. He thinks there’s a reason for him to survive until now and Soo-Mi agrees, but with doubts plastered on her face. Ji-Won is walking around the campus when her friend snaps a few pictures of her. She tells her friend to send the photo to her once it’s out. She then meets Sun-Woo for her usual routine of reading books to him. Ji-Won keeps reading but soon stopped by Sun-Woo as her voice is cracked. He sighs over the fact that he can’t do anything for her, but she actually has a wish. He agrees to do it for her. She wants to watch a movie but no one wants to come with her,so she wants to watch it with him. Off they go to the cinema, where they’re the only audiences. Ji-Won explains what is happening to Sun-Woo but soon screams when she’s scared. Sun-Woo tells her to explain first before screaming. She tries to do so but again, she gets scared and starts screaming while closing her eyes. He chuckles at her reaction. They walk around as Sun-Woo marvels about Ji-Won being a bright student to be able to enter the university. She suggests him to further his studies and promises to help him. He agrees to give it a try and asks for her help about something. Sun-Woo actually wants Ji-Won to help him pick a new jacket and complaints how Geum-Jool picked weird colors for him before. He tries a few jackets until Ji-Won finds one that’s suitable for him. In the midst of him trying all the jackets, a man also uses the same changing room with him. Sun-Woo pays for it and walks out, but he’s suddenly stopped by the man. He accuses Sun-Woo of stealing his wallet and it turns out that Sun-Woo took his jacket by mistake. 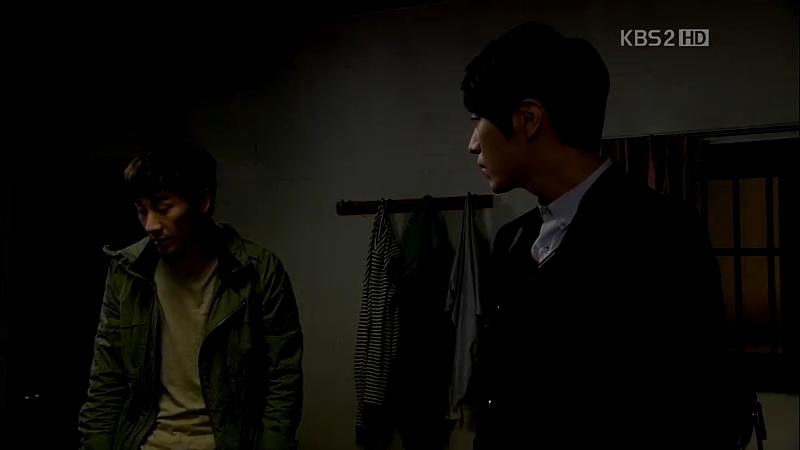 The man starts insulting him and Ji-Won gets angry at the man for accusing him like that. She tries to make him apologizes but Sun-Woo gets pushed by him. Ji-Won slaps him and she also gets pushed by him. She brings out some eggs from her backpack and throws them at the man. Sun-Woo can’t hold his anger anymore when Ji-Won falls because of the man and hits him with his cane. After all the fighting, they ride the bus to go back. 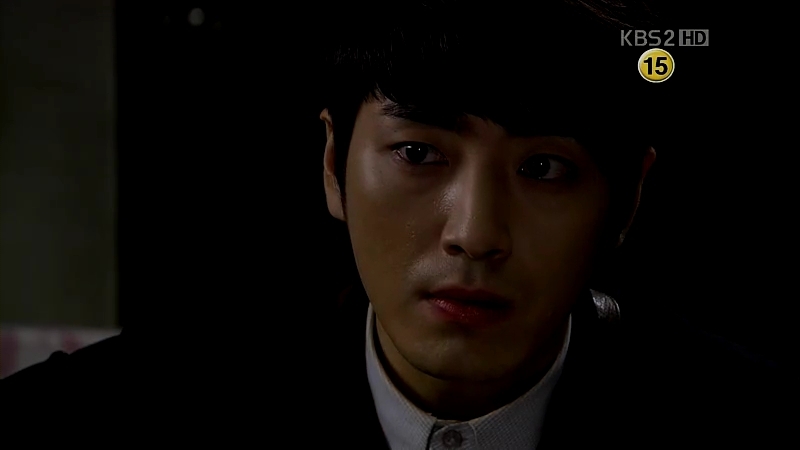 Ji-Won apologizes, but Sun-Woo feels that he’s the one who should be sorry. She gives him one of the earphone buds and they listen to the audio novel along the journey. Ji-Won takes the opportunity to look at him before calling his name. Without any hesitation, she plants a kiss on his lips. Meanwhile, Mrs Ma is out to a gallery with Yun-Joo. It looks like Yun-Joo has given up her dream to get married and chooses to study abroad. They walk around the gallery, trying to pick up some paintings. Soo-Mi is also there and she eyes the mother and daughter with slight jealousy. She overhears their conversation about having a gallery and signing talented artists to work for them. Soo-Mi is quick enough to see the opportunity and pretends to drop her paintings in front of them. Yun-Joo helps her to pick them up, but Mrs Ma tells her to hurry up before they leave. Another opportunity is leaving Soo-Mi. Their next agenda turn out to be a lunch with Jang-Il. Mrs Ma introduces Yun-Joo to him and asks for his help to find someone compatible for her daughter. She then tells Jang-Il that she can also introduces some girls to him but he thinks it’s too early for him to think about it. Geum-Jool decides to sneak into Chairman Jin’s villa per Sun-Woo’s request. She’s about to take one of the hanging frames when Yong-Bae walks into the room to tend the flowers. He’s almost caught but luckily, the telephone rings. Yong-Bae answers it and he takes the opportunity to take the frame. Yong-Bae realizes that it is missing and replaces it with another frame. Sun-Woo gets the picture and the lady confirms that the man was indeed Chairman Jin. 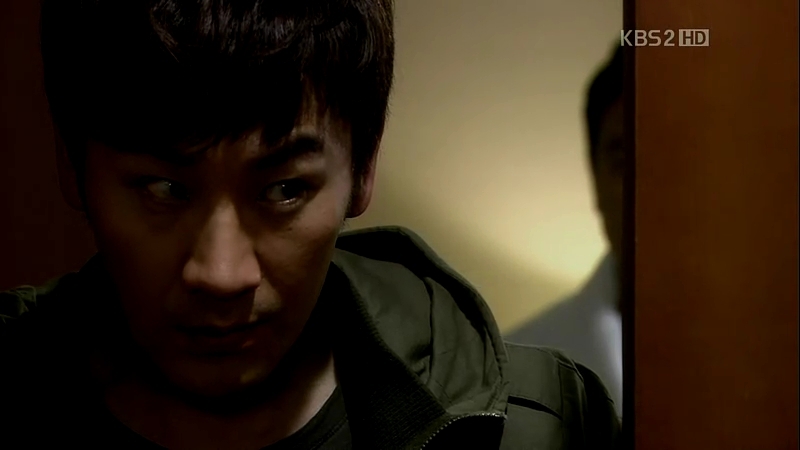 The scene cuts to another one, where Ji-Won asks why he went to the police. He promises to tells her later but suddenly, a car driven by Chairman Jin comes towards them. She pushes him away and she gets hit by the car. Sun-Woo wakes up from the dream, realizing that the matter can be dangerous if she continues to stay besides him. She’s about to read another book for him, but he suggests her to help someone else. He walks away with a heavy heart as she looks at him. As he expected before, Chairman Jin receives another letter. In the voice over, Gwang-Chun warns Chairman Jin not to do anything stupid as he prepares the place for him to put the money. The chairman keeps thinking the possibility of Sun-Woo being the one who sent the letters. 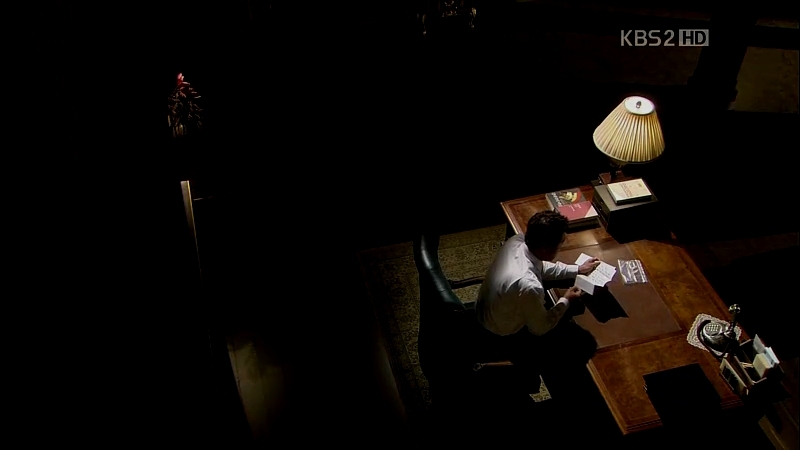 At his small house, Sun-Woo realizes that the paper he used to write his thoughts is missing. The paper is now in Soo-Mi’s hands, who tries to create a painting based on the Braille script. Ji-Won goes to the rehab center, but Sun-Woo is nowhere to be found. She visits his house but no one answers him. He’s actually out, walking around by himself. Ji-Won decides to wait for him as he stands somewhere alone, overhearing a couple musing over the beautiful scenery that he can’t see. 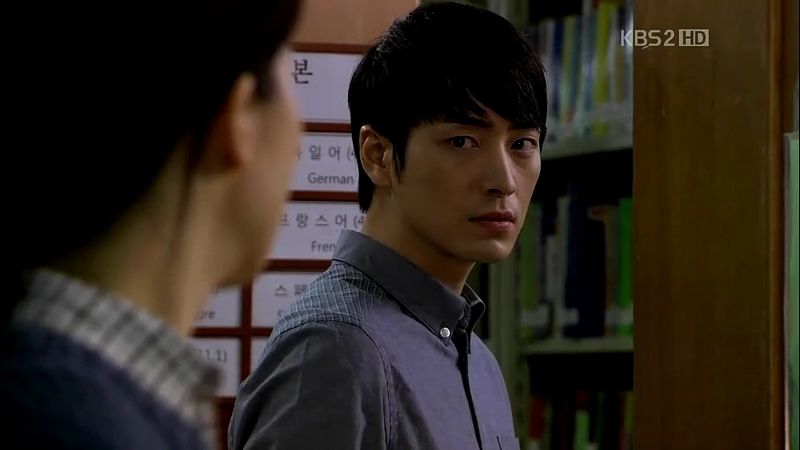 As for Jang-Il,he mistakes someone as Ji-Won at the library. He goes to Sun-Woo’s place later but find Ji-Won waiting for his friend in front of the place. 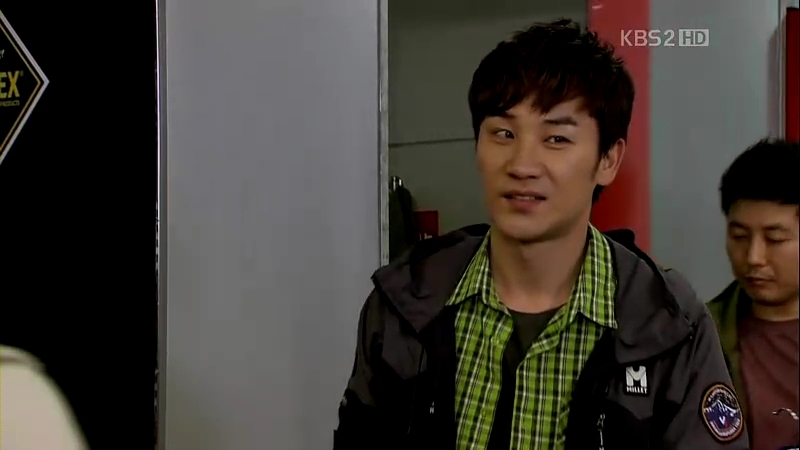 He looks at them from afar as Ji-Won follows Sun-Woo into his house. With her usual cheerful self, Ji-Won wonders why Sun-Woo didn’t show up at the center. He suddenly wishes for her to stop acting like an angel and refuses to accept her help anymore. Her face falls and she explains that her help isn’t a volunteer service; it’s for her first love. She tells the truth about their meeting two years back. 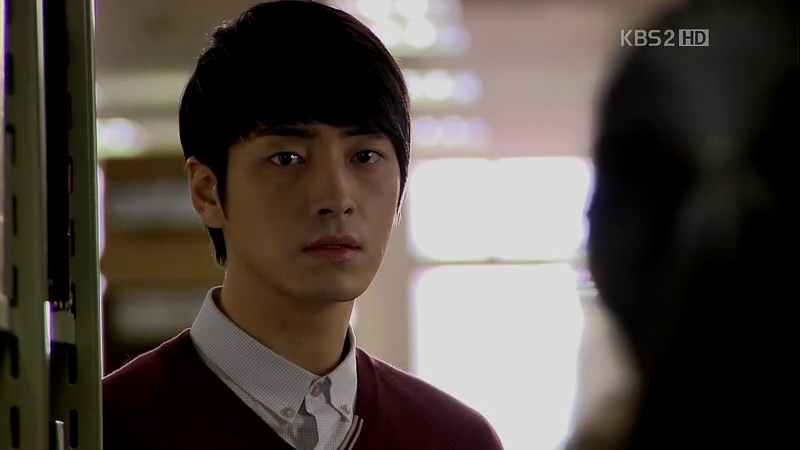 Sun-Woo looks a little shaken, but soon says that he’s not the same boy anymore. Even if he gets his sight back, he can never recognize her. She assures him that she’ll be the one who recognizes him, but he keeps telling her to stop pitying him. 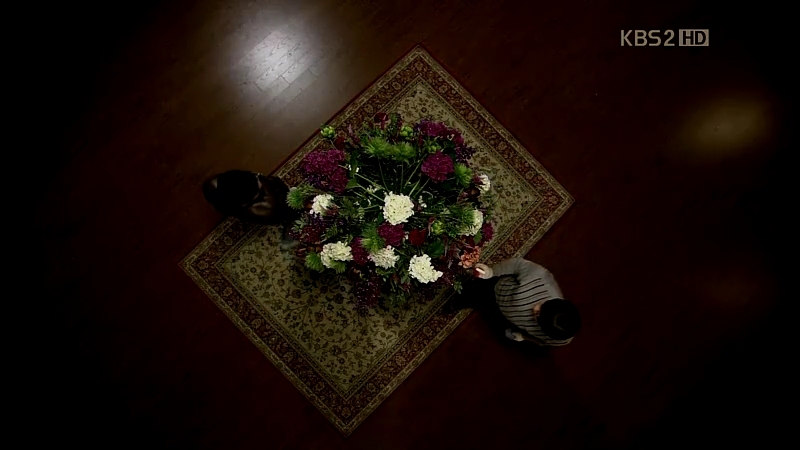 Ji-Won is disappointed and leaves the place in tears as Jang-Il watches her walks away. Sun-Woo decides to run after Ji-Won but meets with Jang-Il outside. They have a talk inside and Jang-Il tells Sun-Woo that he knows Ji-Won. He wants Sun-Woo to get over his feelings as he hurts to see his friend hurting because of love. Unexpectedly, he wants Sun-Woo to open his eyes first before starting any relationship with her. 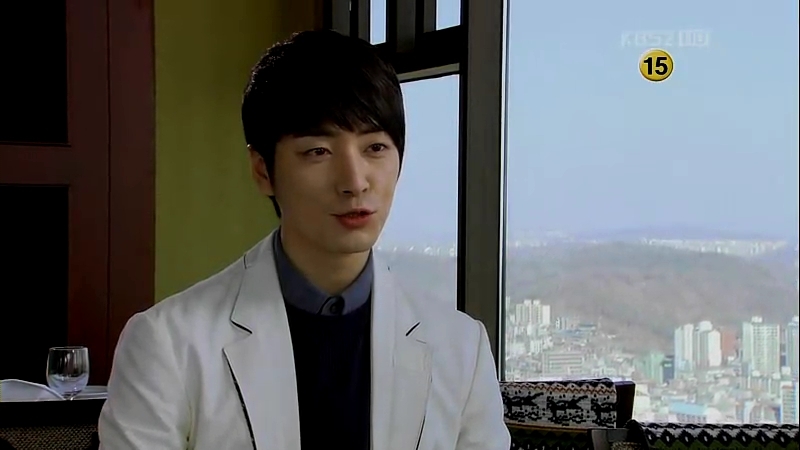 Sun-Woo starts to get angry and questions the reason why he must live like that. Jang-Il apologizes as he doesn’t know the reason, but he’s left speechless when Sun-Woo demands to know the reason he’s feeling sorry towards him. Sun-Woo shouts at him, and Jang-Il reminds him that his relationship with Ji-Won won’t work. That surely ticks Sun-Woo off and he starts punching Jang-Il as he vows to open his eyes and make Ji-Won his. Jang-Il pushes him away and leaves as Sun-Woo catches his breath after the fight. Jang-Il chooses to forget the matter by drinking but he’s disturbed by Soo-Mi, who is angry because he didn’t keep his promise about her clothes. She doesn’t want him to continue living like a weak person and thinks they are alike as both of them are ambitious in their own ways. He warns her not to act like she knows him so well as he knows they can’t be happy. She wants him to stop drinking, but he wonders why she likes him so much. Soo-Mi thinks there’s no absolute reason and he agrees: there isn’t any, or everything can be the reason. She promises not to come to his house again and gets ready to leave, but Jang-Il starts talking about Sun-Woo, wondering about his feelings to be liked by someone. Soo-Mi is tired of his nonsense talking and splashes the alcohol on his face to make him awake. Soo-Mi warns him not to treat her mindlessly, but he demands the reason why he should do that. She remains silent and Jang-Il suddenly forces a kiss on her. She tries to escape, but soon she gives in. And the next day, Soo-Mi wakes up, with Jang-Il sleeping beside her.She reaches to touch his face and suddenly, Jang-Il calls out Ji-Won’s name, pleading her not to go away. That isn’t what she wanted to hear after spending her night with him and she leaves. It’s raining and reminds Soo-Mi of the first time he met with Jang-Il. She realizes that he won’t be there to offer his umbrella anymore and walks under the falling rain. Sun-Woo goes to the center only to find out that Ji-Won has quit her volunteer job. He goes to her campus and sits on a bench as he listens to the sounds and voices around him. Ji-Won is also in one of the classrooms, deep in her own thought. She walks near the place where Sun-Woo sits but she doesn’t see him. He stays there until the night comes and Jang-Il sees him there. Jang-Il follows him as he leaves but soon stops doing so. The traffic light is red and Sun-Woo crosses the road after hearing the signal. Unfortunately, a group of bikers don’t stop and hits him. He falls on the road and tries to retrieve his cane, but it’s broken. The rain pours and Sun-Woo laughs at his inability to do anything, even for himself. He reaches home even with his injured legs and thinks he’s alone, but he can feel that someone is also there. That someone is Moon Tae-Joo and his assistant, not Ji-Won as he thinks. He pleads to his dead father to make him into a fool and erase Jang-Il from his sight. He wrecks his own house and breaks the mirror before Tae-Joo stops him. He demands to know who is him and thinks he’s Jang-Il. Moon Tae-Joo’s answer? Simple. He introduces himself as his father and the one who will change his life. In this episode, Jang-Il is the most pathetic character. He was, will, and always be one, unless he decides to embrace what he had done wrong instead of running away from that mistake. He might seem to be a boy who’s confused and made a mistake because of his immaturity, but seeing him in his 20s, trying to act like nothing happened irks me a little. Luckily he still has some sympathy towards Sun-Woo and he cares about him, even it’s not that much. No matter what people think about Soo-Mi, I still think she’s a strong woman. She’s someone who cherishes people around her, but she’s someone who voices out her every single opinion and ends up hurting people most of the time. She’s a cool person and I hope she continues to be one and not being trampled over her love towards Jang-Il. I enjoy watching Sun-Woo and Ji-Won together, but I don’t think what Sun-Woo did can be considered as noble idiocy. He did the right thing, considering how scary Chairman Jin could be, and by letting Ji-Won free from him, she will be able to walk her own path instead of taking care of him all the time. Wise choice he made, even if it’s breaking everyone’s heart. Next Post 1st Look Loves Jung Il Woo..
Can I say how much I am obsessed with this drama?!! Episodes 9 and 10 cannot come out fast enough for me! As I have said, I was a lover of Alfred Hitchcock movies especially with Wait Until Dark being one of my favorites as well as Rear Window. If the writers did not have Hitchcock in mind, the musical director definitely did and it showed in volumes during this episode especially with the climatic end. You cannot believe how happy I was to see Tae Joo finally take control of Sun Woo’s life. To me, this was the bottom and a nicely done transition to the future! I could not have been happier at that moment! Finally, he’s here! That’s exactly my reaction when he appears in front of SW. No one can save SW except him! And yeah, you have to watch ep 9!! Its my crack too! I’ve watched each episode (except Sun Woo getting hit) at least 2 times! EPISODE 9!!!??? The games commence!!!! It is f**** fantastic!! For Episode 10, I officially LOVE Soo Mi!!!!! Watch and see what I mean! Wonderful episode (except for the acting like I don’t know you!) Jang Il, you still don’t have a chance in HELL!